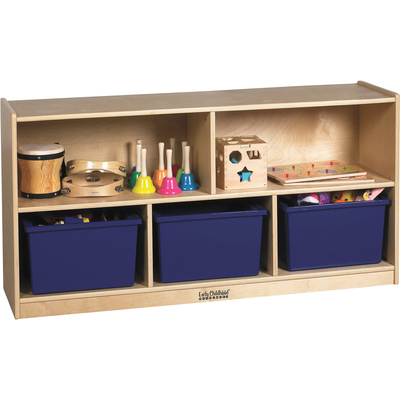 Organize Toys, Games And Supplies With This Five-Compartment Storage Cabinet. It Is Made Of Durable Birch With A Beautiful Natural Finish. Each Compartment Measures 12" Deep To Hold Books, Blocks Or Supplies. The 24" Height Offers Easy Reach For Children Ages 3 And Older. Cabinet Includes Heavy-Duty Casters For Mobility..
Organize Toys, Games And Supplies With This Five-Compartment Storage Cabinet. It Is Made Of Durable Birch With A Beautiful Natural Finish. Each Compartment Measures 12" Deep To Hold Books, Blocks Or Supplies. The 24" Height Offers Easy Reach For Children Ages 3 And Older. Cabinet Includes Heavy-Duty Casters For Mobility.